When you own a swimmng pool you have a built in party spot and when you landscape it and have an outdoor living area you can swim, entertain, then swim again! How to properly landscape the poolside area is something your swimming pool contractor from A Clear Choice pool service company in Menifee, California can help you with. The next time we are at your home performing a pool service and maintenance visit, let’s talk about your ideas for landscaping around the pool, adding a kitchen or other outdoor amenity and let’s help you realize your dream. If you had your pool constructed, but didn’t really put much thought into how much time you would actually spend poolside. Many people don’t. They are so focused on getting the pool constructed that the deck and outdoor living space is a secondary item. The outdoor living space and even a pool deck is where the fun and excitement will happen when you’re not in the pool. The outdoor living space and landscaped area will also be a place to simply kick back and relax when you don’t want to swim, but you aren’t ready to be indoors. Adding landscaping and an outdoor living area may require grading of the land around the pool and this needs to be done with care as you don’t want to grade the area and have run off of water and mud trickle down into the pool. 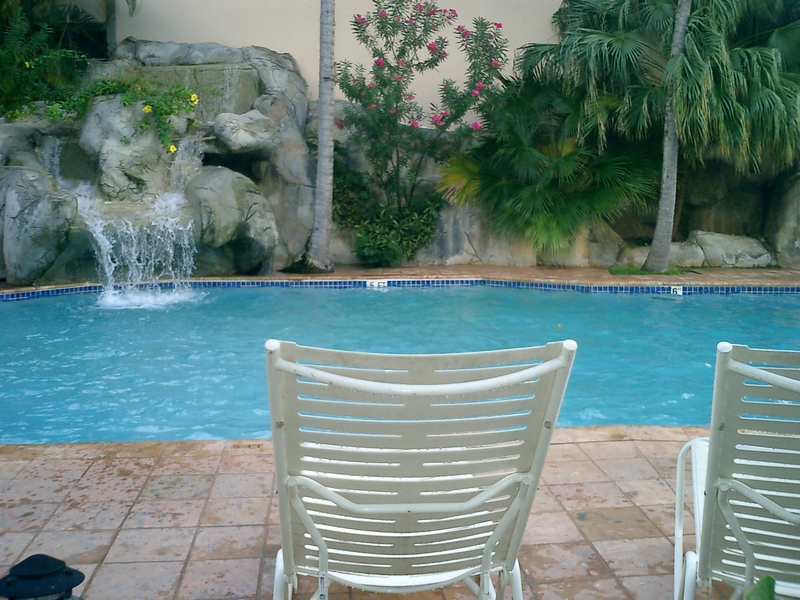 Talk with us about drainage, plumbing, electricity and other items for your poolside space. You may also consider adding a structure like a gazebo, poolhouse or other building as part of the project. Landscaping around the swimming pool should be functional as well as beautiful and relaxing. Landscape and plant trees or shrubbery in a way that helps cut down on wind blowing across the top of the pool and leading to pool water evaporation. Remember too, whatever you plant around the pool will have the potential to drop leaves into the pool water, so work with us to make certain you’re not planting items that will make a mess of your pool water and lead to higher maintenance fees. If a pool landscaping project is in your future, give us a call and let’s get the conversation started.